Energy Efficient Compressor: State-of-the-Art cooling technology makes your compressor efficient, quiet and provides even cooling without fluctuations. 46 Bottle Capacity: Cooler has 5 beech wood shelves to hold each bottle securely and has spaces for 46 wine bottles. Whether you are just beginning your journey into the incredibly nuanced world of fine wine and potent potables, or are a well versed wine connoisseur, storing your wine at the perfect temperature is something that is almost imperative if you want to enjoy all that your vino has to offer. Managing the serving temperature and storage temperature takes work, but when it comes to maintaining the 55 degree Fahrenheit temperature that all whites and reds need for storage, a dedicated wine refrigerator or cooler is the best way to go. These types of refrigerators can vary and there are many types on the market, but we’ve compiled a list of the top three available today as well as a very serviceable model for the more budget-conscious. When it comes to the very exacting specifications of maintaining the appropriated temperatures of stored beverages, U.S. based company Newair has garnered quite a reputation since the company’s founding in 2002. The Newair Kalamera wine refrigerator, with its excellent feature-set and design aesthetic, is our number one Gold Pick and a great purchase if you are looking for reliability, charm, and functionality. This cooler has a 46 bottle capacity and employs all of the features that you need to provide perfectly chilled vintages for you and your esteemed guests. As knowing the size of the item can help you get an idea of how it will fit in your home, here are this product’s dimensions. This wine refrigerator is 22.4 inches in length, 23.4 inches in depth, and 33 inches in height. For the purposes of moving the unit, it’s fairly heavy at 105 pounds, but these types of devices aren’t really designed with extensive portability in mind. From a design point of view, this is an elegant looking machine that blends well with nearly any design décor that you surround it with. The majority of the body is a stylish black that is trimmed in stainless steel. The interior of the cabinet is illuminated with a series of blue LED lighting fixtures that highlight the luster of the stored bottles. Finally, each rack is made of crafted wood that adds a warm feeling to the overall aesthetic of the refrigerator. The unit has the ability to be freestanding and independent of kitchen fixtures and cabinetry, or it can be installed directly into any available slots in your kitchen’s décor, such as a space reserved for a trash compactor or dishwasher. This cooler keeps both serving and storage temperatures in mind with its dual zone wine storage system. As mentioned previously, most wine should be store at or around 55 degrees Fahrenheit, and the serving temperature of any wine varies greatly dependent on color and type. The Kalamera solves this discrepancy by having two independently cooled zones. Having company? Keep the wine in the lower compartment at the perfect storage temperature and attune the temperature of the top compartment’s wines to the perfect temperature for what you’ll be serving to your guests. A digitally adjustable, independent dual climate control system makes this a possibility and this functionality adds much versatility to this wine refrigerator. Both sections of this refrigerator take advantage of several refrigeration technologies designed to maintain perfect temperature; the door is comprised of dual pane protective glass and the body of the unit itself employs triple layer insulation to keep your prized wines at their ideal temperatures. For safety, the door can also be locked to provide security for your valuable vintages. Ambient noise and vibration can be harmful to your peace of mind and to the quality of your wines. Excess vibration and sound can cause disturbances in the natural sediments that are present in the best wines and reduce the complexity of their flavors. To avoid this, Newair has utilized a specialized compressor that not only cools each compartment to your specifications, but also runs vibration free to ensure the lastingness of your wine selection. Typically, compressors are noisy and have minute vibrations; the fact that Newair was able to manufacture one without these flaws is an amazing engineering accomplishment. The compressor, which is a state-of-the-art unit that’s capable of producing temperatures of 40 to 60 degrees Fahrenheit, is also very energy efficient to ensure that while you keep you wines cool, you don’t incur a drain on your monthly electric bill. Another great feature of this compressor is that it will provide this balanced dual layered cooling with zero fluctuations. The Kalamera 24 inch 46-bottle Wine Refrigerator can be found on Amazon for $899. Newair has provided an in-home warranty that includes repairs for this unit for one year that you own the appliance. Our silver pick selection has many great features that will help any wine connoisseur maintain perfect temperatures for their various vintages. Akdy makes a plethora of varying products that range from range hoods to shower panels. Their WC0019 thermoelectric wine cooler, which can store up to 32 bottles of vino, employs great features and intricate design to create an excellent cooling experience. The product dimensions are as follows: this cooler is 20 inches high, 20.7 inches wide, and 32.3 inches in height. The unit weighs around 88 pounds and it is built to be durable as well as more convenient to move from place to place within your home than our Gold Pick wine refrigerator. The WC0019 is one of the most sleek looking wine refrigerators on the market today. The entire unit is colored black, even the front section containing the glass doors. Positioned at the top of these doors are the electronic temperature controls that allow you to regulate the internal temps of both compartments independently. Two large, sturdy stainless steel handles are positioned along the inside edges of this cooler, which are a very stylish looking feature, especially considering that they are set on a nearly all-black colored appliance. Attractiveness was clearly a design intent, as the doors provide an unimpeded view of your precious wine collection. A blue tinted LED light, which can be turned on or off, is positioned at the top of the unit that also provides a beautiful azure tint to your favorite vintages. 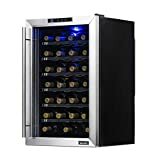 Similarly to the Newair unit, this wine cooler has two separate bottle storing zones for your wines that have independent temperature settings. Each section of the Akdy model has room for 16 bottles of your finest vintage and, unlike the Newair, has two separate outward-swinging doors that ensure that when you are retrieving a wine from one temperature zone, the other wines in the other zone aren’t warmed by the room’s ambient temperature. Even though, in many situations, it’s best to keep wine at the 55 degree mark, some prefer their whites at a different temperature than their reds and this type of setup is perfect for those with this preference. UV rays can ruin a wine’s flavor. Having a simple glass door that isn’t protected from the sun’s influence positioned in a place where UV rays can hit it will quickly ruin your prized wine collection. Akdy addresses this by utilizing a double paned door to help keep these harmful rays away from your precious vintages as well as providing extended temperature protection and insulation. The legs of this unit are also designed to reduce the vibrations that can be present in any home and are quite sturdy to resist the damage that can be caused by children, pets, and life’s little accidents. 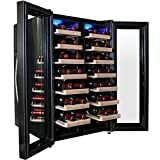 A unique technical feature of this wine refrigerator is the thermoelectric system that is used to keep the wines in each compartment cool. As a rule, thermoelectric wine coolers have a lower power consumption, produce less noise, have a lower purchase price, tend to weigh less, and produce far less vibrations than their compressor-based counterparts. For the environmentally minded, these types are also more eco-friendly as they require no coolants, are Chlorofluorocarbon (CFC) free, and are absolutely silent when running. Since this type is vibration free, you don’t have to worry about sediments in your wines being disturbed by a compressor’s minute shaking and having their flavors changed. 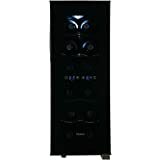 This Akdy wine refrigerator can be purchased on Amazon for $449 and this purchase includes a one year manufacturer’s warranty against any defects that might have occurred during device manufacture. Our Bronze Pick is another entry from refrigeration specialist Newair. 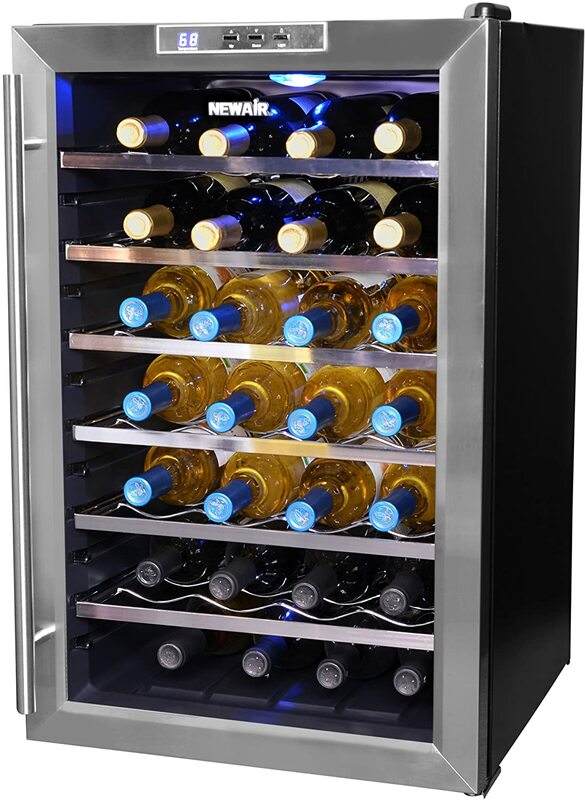 The NewAir AW-281E 28 Bottle Thermoelectric Wine Cooler handles less bottles of wine than NewAir’s Gold Pick unit, but still manages to be a great wine storage option for enthusiasts of any level. This unit comes in a 18.1 inch length, a 20.9 inch depth, and a 29.2 inch height. This refrigerator is also very light at 50 pounds, though you wouldn’t be carrying this unit from place to place often. Its design employs a very stylish two-toned aesthetic; black for the body of the unit and gleaming stainless steel for the trim positioned along the door. There is a stainless steel handle positioned along the right side of the cooler that is sturdy and will last for years. The door itself houses a double-paned glass viewing area that insulates the cooler from heat sources and provides an extra layer of protection from UV damage. Along the top of the main viewing window is the unit’s temperature control LCD. This touch-based interface is fully digital and will allow you to set the desired temperature the wines that you have inside this unit. To adjust the temperature, you can simply utilize the two up and down buttons to provide the precise level of coolness that your wine needs to taste best. Also, to save money, there is a control positioned on the door that allows you to turn the attractive blue LED light that is positioned above your wines on or off. Inside, there are six metal racks that allow you to store up to the 28 bottles that this refrigerator can contain. Each chrome rack is adjustable, so if you have larger bottles that don’t fit quite as well, you can simply remove a rack and place your bottles where you will in the interior. Since noise and vibration can cause damage to the quality of your wines, many modern refrigerator units employ new technologies to reduce these environmental effects. 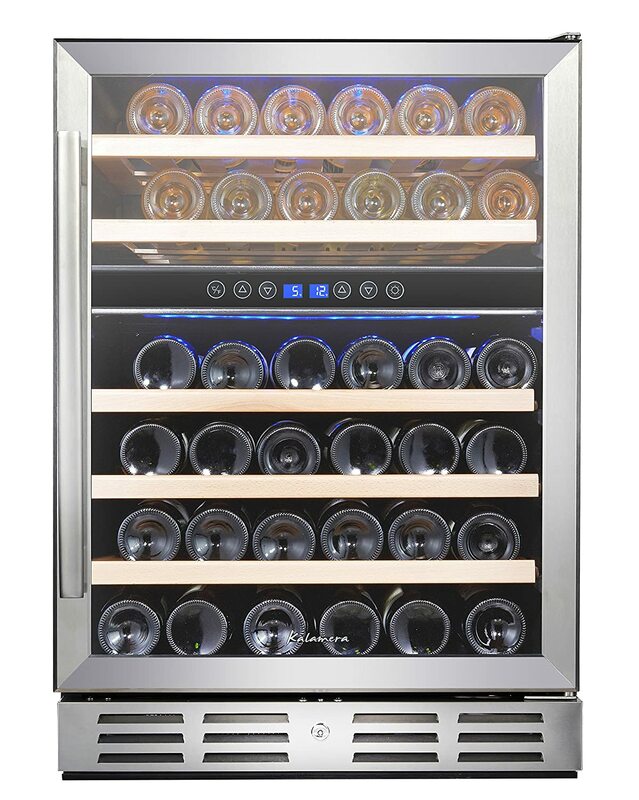 Like our Silver Pick, this unit utilizes a thermoelectric system for keeping your wines cool, stable, and in silence. As a rule, these systems have a lower power consumption rate and aren’t as noisy as those models that utilize a compressor. Typically, these types of cooling systems are cheaper, have less wine-damaging vibrations, and make less ambient noise during daily operation. These types of cooling systems also produce no excess chemicals, and CFCs which can seep into groundwater, are non-existent as a result of daily operation. This unit can be bought on Amazon for $229.36 and the NewAir provides one year of warranty protection for this device. Wine collecting is not just a pursuit that needs to be undertaken by connoisseurs with large budgets, those who don’t want to spend a lot can also engage in the pastime with exceptional results. Our Ballin’ on a Budget entry has a lot of the key features that make it an excellent buy, so if you have a need to stay within a certain price point this wine refrigerator is for you. 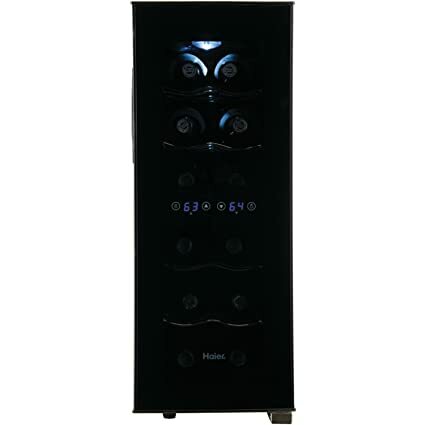 The Haier 12-Bottle Dual Zone Curved Door with Smoked Glass Wine Cellar has some great features for a low price point. Its design, which is uniquely stylish, is every bit the equal of the other, more expensive selections on our list. The entire unit is black with a dual zoned setup that allows each individual half of the refrigerator to have independent cooling settings. Separating the two six bottle wine sections is a digital display that employs touch controls to help manage the temperatures in the separate compartments. Each compartment is also designed for different values; the upper compartment can create temperatures in the 46-66 degree Fahrenheit range, and the lower compartment can create temperatures in the 54-66 degree Fahrenheit range. Unfortunately, and this is probably due to the nature of the dual zone design coupled with the need to keep costs low; while there is a soft blue LED light in the top wine storage compartment, this feature is noticeably missing in the bottom one. This is also the smallest wine refrigerator on our list. With dimensions of 20 inches in depth, 9.9 inches in width, and only 26.3 inches in height and weighing only 31 pounds, this refrigerator can fit in most places very easily, and since it’s so light, it will not be much of a chore when you need to get it to where it needs to go. In addition, this unit employs a compressor-less, thermoelectric system of cooling that helps eliminate noise and vibration as well as reducing your carbon footprint. While this cooler only handles 12 bottles, the door itself is curved with smoked glass that protects your wines from different light sources that might disrupt the quality of your wine collection. The chrome storage racks are also full-width, which means that you’ll need very little adjustment when you store your wine; though with very large bottles you may have to remove a shelf. Finally, this door, which is also fully reversible, has a built-in lock in order to keep this cooler secure from internal and external forces. The Haier 12-Bottle Dual Zone Curved Door with Smoked Glass Wine Cellar is available on Amazon for $184. This unit also has a warranty that works for a year and covers parts and labor. As we’ve mentioned in the reviews, there are two types of cooling systems that are used to manage the temperature of wine refrigerators; thermoelectric and compressor cooling. Whereas thermoelectric would seem more beneficial for the prosperity of your wines, NewAir has developed a compressor that, while still utilizing chemicals for cooling, does a great job at reducing the noise and vibration that can be harmful to your favorite whites and reds. Thermoelectric cooling, while great for noise, the environment, and in reducing vibration, also loses performance when working in warmer ambient temperature environments. When looking for a strong performing cooling unit for you wine collection, always be sure that the cooling system, as a result of its reaction to external or internal stimuli, cannot reduce the quality of your favorite vintage. How much wine are you planning on collecting in a calendar year? 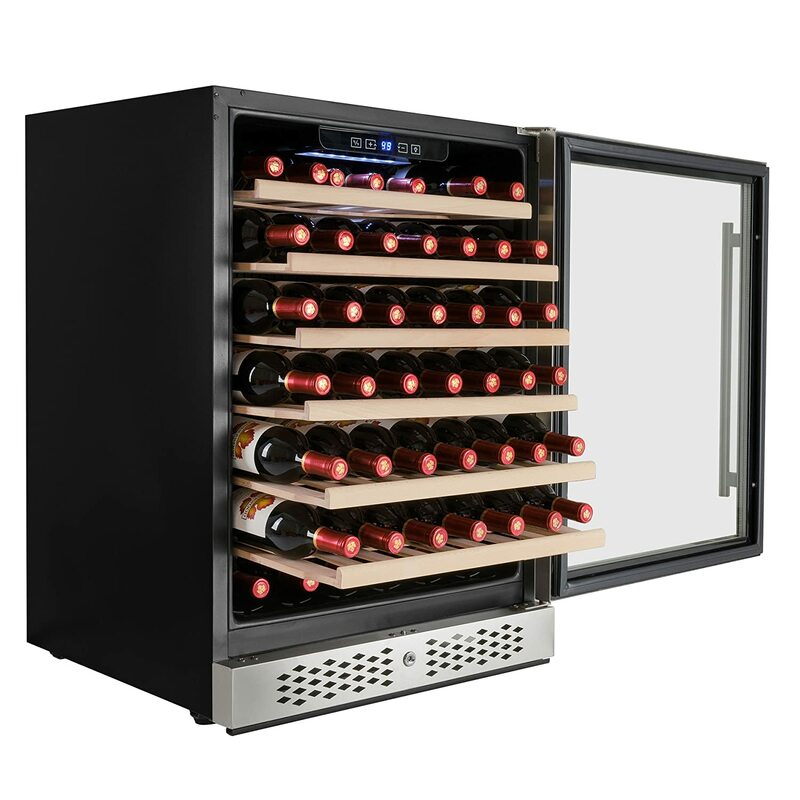 If your answer is over 30 bottles, consider purchasing a wine cooler that has lots of space; over 40 bottles or so. Purchasing a large capacity wine refrigerator also allows for you to remove a rack or two for larger bottles and not lose out too much on your overall wine storage. Some models have chrome racks that can be flipped to add support for wine bottles that have a larger form factor, so if you drink a lot of different wines that come in a plethora of bottle sizes, this type might be for you. Nothing wrong with fostering attention to style when as you are developing your wine collection. In years past, wine connoisseurs grew their collection in cellars with very precisely maintained temperatures and moisture levels. Having a cellar of this type was an indicator of status and personal style. Today, with the advent of the modern wine refrigerator, you can still illicit this sense of style by purchasing a wine refrigerator that appears sleek and stylish to your guests. Blue LEDs are utilized in most modern units to cast a favorable reflection on wines and many a model has smooth black accents that can liven up any décor. When searching for the perfect accompaniment for your wine collection, don’t be afraid to look at the aesthetic side of the unit you’re looking at as well as its functionality. Only ten percent of the wine in the world needs to be aged to enhance its flavor, the remaining 90 percent of the world’s wine is designed for immediate consumption. If you plan on aging your wine, perhaps you should consider purchasing a longer term refrigeration solution. Long term tends to be more than five years of storage. Many wine refrigerators that are available on the market are not designed for this level of storage and typically store best in the one to two year range. Short term storage is great for keeping wine at a serving temperature for a few years rather than just keeping it at the 55 degree Fahrenheit storage temperature for that long. Would you rather keep your whites at serving temperature and your reds in a more storage friendly climate? Then, perhaps you should consider purchasing a independently controlled dual body wine refrigerator that will give you that option. If you like to just store your wines at the best temperature and don’t partake too often or host, then a single storage option might be best for you. As you must know by now, temperature is of tantamount important to the entire wine enjoying experience. Every vineyard that has created a wine that is expected to be aged for enjoyment intends for the storage of that wine to be set at the appropriate 55 degrees Fahrenheit. Serving temperatures, on the other hand, are quite different. As a general rule, white wines should be served around 45-52 degrees Fahrenheit (with some exceptions), and red wines should be served at temperatures between 58-65 degrees, generally. As a rule of thumb, the lighter the wine, the colder it should be served and conversely, the bigger the wine, the warmer it should be served. With all of this in mind, be sure that you purchase your wine refrigerator with its temperature settings and your wine preferences in mind; it simply wouldn’t do for you to enjoy a Malbec red and not have a cooling system that can warm it to its optimal temperature of 64 degrees Fahrenheit. Any wine refrigerator you purchase has four main enemies that it must combat for your collection to flourish and your hobby to grow. These enemies are the temperature variations that a good cooling system should handle, UV or incandescent light that can be filtered to avoid damaging the flavor of your vintages, low humidity that will dry out your cork and let harmful oxygen into your wine bottles, and the damage cause by sediment vibration, which vibration-free compressor technology or thermoelectric cooling systems eliminates. When searching for a great wine cooler, make sure that it has features that fight all of these enemies of wine collection, and you’ll be a very happy wine connoisseur.